Using passive voice to withering effect on a grocery store employee is not what I had expected from my Friday night, but it’s where I ended up when I decided to learn how to make great pie in a weekend. I have very few absolute goals in life — as far as where I want to be in five years, how much money I want to have, or places to see before I die — but I really want to be good at making pies. Its attractions are threefold. First, a good pie is universally welcome. Second, mediocre pies — from grocery store bakeries or home cooks who use Crisco — are far too common. Third, only a portion of good pie-making can be taught, the rest is learned by experience. It’s not just cooking, it’s craft. Most of the great pie I’ve had in my life has been at Hoosier Mama Pie Company, my favorite place in Chicago. Owner Paula Haney left a pastry chef job at a more upscale restaurant to focus on perfecting America’s dessert in her own shop in 2009, and the results are divine. A bite of Hoosier Mama pie is like everything good about the world, in your mouth. (A friend of mine once went into the shop and asked if they would let him volunteer. “I’ll chop fruit or wash dishes, anything you want,” he said, “I just want to be involved.” His offer was politely declined.) When Haney published The Hoosier Mama Book of Pie earlier this summer, it felt like a personal gift, like she was rooting for me. I decided to put myself through pie boot camp, making four pies in one day — Strawberry Rhubarb, Maple Pecan, Hoosier Sugar Cream, and Lemon Chess — and inviting 10 friends over to eat them. My main goal was the crust, the deceptively simple foundation of a good pie. When you’re making pie crust, every detail is important: the temperature of the ingredients, how long you spend on each step, how long you wait in between each step, how much water you add, how long you knead the dough, and whether you’re chronically forgetful about flouring the roller (that’s me). Haney spent a summer perfecting her crust recipe, and provides 20 pictures of what the dough should look like at various steps. There are instructions, yes, but you’re making all the decisions about whether the dough feels crumbly, soft, cool, or relaxed enough to move on to the next step. The stinger is, a mistake at any point in the process can ruin the crust, like the bad bulb in a string of Christmas lights. No matter how many crusts you’ve made, you still have to pay attention to each one and be able to adjust. I can say that the fourth crust I made that day was better than the first, but that only made me realize how much better I can get. It’s no mistake that on the cover, the word “wisdom” in the book’s subtitle — “Recipes, Techniques, and Wisdom from the Hoosier Mama Pie Co.” — is printed about three times larger than all the other words. The book wants you to understand pie. The recipes have origin stories, there’s a section titled “In Defense of Canned Pumpkin,” a sidebar on the history of Crisco (spoiler: it’s cautionary), and a Pie Dough Troubleshooting Guide, but the real message is that you need to practice. You may also need to traverse the city in search of vanilla paste. 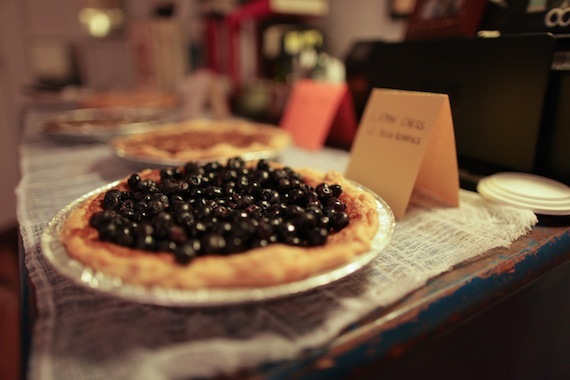 At one a.m. the night before my party, as I was putting the last dough round into the fridge to rest overnight, pie crust took on greater meaning for me. A great pie is a product of both skill and wisdom; as, I believe, is a great life. You make a long string of intuitive decisions and hope they alchemize into something beautiful. That’s why each good pie that comes out of the oven felt like a win to me; it feels like a small reassurance that you’re good at life. Plus, delicious. It's all a question of the right book for the right occasion. For some people, that occasion will be at a bar where you’ll hear the zizzing of vuvuzelas, the shouting of national anthems, the thumping of a jabulani. It’s hard to justify spending hours in front of the screen, drinking beer no less, unless, of course, you bring a book. “Dostoevsky was a sick man. He was spiteful, intolerant, and irritable. Turgenev once described him as the nastiest Christian he had ever met.” – Andrew R. MacAndrew, Translator of Notes from Underground.I’d like to think that, 200 years from now, I’ll be immortalized with a Penguin Classics edition of my life’s work – a 700-page tome spanning my early blogging career to my brilliance in advertising copy to my eventual Great American Whatever. I see it bound in something collectible – my skin, perhaps, or threads of wallpaper from the basement where all of the magic happened.It will have an introduction, of course. The introduction will be written by someone incredibly talented and well-thought-of. I imagine a design by Chris Ware (okay, he’ll be dead, so a design by Chris Ware’s great grandchildren or something. Humor me here. )Some things that might be included in my introduction:Corey Vilhauer started his career in the trenches of the Sioux Falls School District, working as an embattled troll in the substitute teaching pool.Vilhauer worked his way up, gaining employment as a writer through sheer will and ruthless determination (not to mention rugged good looks and undeniable charm. )Until mid-January, 2007, Vilhauer usually skipped the introductions to classic and modern novels, preferring to get right to the story.It’s true. I did. Until this month, I never took time to read introductions and appendixes. I just flipped to the point where the page numbers stopped looking so Roman and started looking more Arabic. I wanted to read the novel, not the author’s life story. Who has time for introductions?And then – Dostoevsky. Fyodor Dostoevsky. More specifically, Notes from Underground (and other stories) – this months Corey Vilhauer Book of the Month.I’m going to assume that most of you have dabbled in Dostoevsky’s mire. You’ve drudged your way through some of the most depressing and thought-provoking personal reflection ever written. Most of you probably even read the introduction. However, some of you probably didn’t. I’m here for you. I know what that’s like. I’ve been there.Notes from Underground, for those who have yet to read it, was written a few years after Dostoevsky was sentenced to death. To death! Why? Because he spoke out. Because he was a dissident in Mother Russia and needed to be stopped.He wasn’t killed. No – of course he wasn’t. He had three more monstrous, billion-page novels to write before he was ready to expire. But he was tortured, mentally, by the powers-that-be. From Andrew R. MacAndrew’s Afterword:On December 21, 1849, the prisoners were taken to a city square for public execution. The death sentence was read to them, they were given the cross to kiss, a sword was symbolically broken over their heads, and they were ordered to don special white shirts. They were to be shot three by three. The first three were bound to the execution posts. Dostoevsky was the sixth in line – that is, he was to be executed in the second batch.Suddenly the tsar’s messenger appeared on a foaming horse and announced that the tsar was graciously making them a present of their lives. There was a beating of drums. The retreat was sounded. The men already tied to the posts were untied and sent back to rejoin the others. Some prisoners fainted. Two went permanently insane. The effect on Dostoevsky, too, was shattering. The epileptic fits to which he had been subject since his childhood became incomparably worse.He was nearly killed. Then, the tsar came riding up, saying, “never mind, dude – imprisonment for eight years (four, with the tsar’s blessing, of course) will be fine.” The people around him went crazy. He was a changed man from then on.And, by reading the Introduction, and in finishing with the Afterword, I discovered the aforementioned history. I learned something about Dostoevsky that is far more interesting than anything I could have imagined.Notes from Underground follows the insecure wanderings of a man so depressed – so annoyed with life and dragged down by its horrible tentacles – that he can’t do anything but complain. He tags along with some “friends” to feel included, but ends up berating them for hours. He searches for them later (to duel, of course) and instead ends up berating a whore in much the same way.He hates himself and seeks relief, but whenever that relief shows up, he shuns it. He’s miserable – both in feeling and in action. He’s nothing. He talks symbolically of the mouse hole that he’s lived in for 20 years, and in reading, you figure it’s not just symbolic. It is necessary.Notes from Underground is written by someone who had been driven mad – maybe not certifiably, but at least minimally enough to devise a hateful character as the narrator. Dostoevsky ended up a grizzled, horrible person – hard to be around, yet amazingly talented. Some say he ended up too sentimental. Others say he was too hard. I found him to be brilliant, if not a little misunderstood. I also found him to be just as miserable as his protagonist.In writing a story like Notes from Underground, talent can only take you so far. Dostoevsky didn’t just create a character from scratch, taking pen and placing it on paper and writing from the creative depths of his mind. He was writing from his heart – shaping a character that was actively driving himself mad, just as those who he had been sentenced to death with were driven mad – little by little, through deception and mind control.Notes from Underground is quite a task – it’s short, but it drives one to annoyed rage. “Just be nice, for once!” you might yell. But in yelling that, you’re directing it as Dostoevsky himself. This is all internalized. No wonder he’s so hateful. After all, look at what he went through.And to think I used to skip those “life story” sections.Corey Vilhauer – Black Marks on Wood PulpCVBoMC 2006, 2007: Jan.
Is he alive, or is he dead? There are moments in this very funny, very ghoulish novella when he seems definitely one or the other; other moments when he might somehow be both. He's roughly the fictional equivalent of Schrödinger's cat. Hamilton has channeled the effusive energy of the revolution to create a narrative of stunning fragments. But the fragments hardly coalesce to constitute a novel.